Imagine waking up in the morning with no place to be – no two-hour commute. You set your hours. You can work in a café or at your dining room table. You choose. While it may seem like a fairytale, I can assure you it’s not. And while leaving your full-time job to become a digital nomad might not be your particular brand of whiskey, there are still many ways you can earn extra cash with your smartphone or laptop. Whether you’re pivoting into a new career or need some extra cash for a dinner date with your significant other, I’m going to show you the best resources available to start making money online today. Shield yourself from the lemons life throws at you - pad your financial cushion with multiple income streams. One of the easiest ways to monetize your time is by taking online surveys. You won’t be swimming in money from this side hustle, but it will line your pockets with extra cash, gift cards and points. They also offer cashback signup bonuses. Seated – book restaurant reservations thru them, and you’ll receive up to 30% in gift cards rewards. Similar to online surveys, user testing pays you to navigate websites to determine if they’re user-friendly. No website owner wants their visitors steering away from their site because of bad design choices. You can be one of those people who informs them of their choice of a hot pink orbitron font is… unnerving. Earn up to $15 for 20 minutes of work. Sites like UserTesting, Enroll, and TryMyUI are worth a look. All those articles you read on the web from How to Get Free Internet In An RV to Can I Reuse A Pregnancy Test (spoiler alert: you can’t!)? were written by a freelance writer. (Yes, those were just a few of the articles I’ve written in the past as a ghostwriter). Earning extra money as a freelance writer is a lucrative hustle. Thanks to the internet, it’s an excellent source of both part-time and full-time work. Topics you’re interested in are an excellent place to start. It’s easier to write about stuff you care about (Let me stop you right there. No, I’m not interested in whether or not I can reuse a pregnancy test. It was an assignment. I’m a professional damn it!). Or, write about stuff that pisses you off. Plenty of businesses need your services to write eBooks, sales and landing pages, articles, and blog posts. Or, be an influencer’s ghostwriter. Check out sites like PeoplePerHour or Upwork. These are great places to market your services and get some skin in the game. Or take a look at sites catered to writers like Morning Coffee Newsletter, Freelance Writing Gigs, and Publoft. Also, look at FaceBook groups in your niche. That’s how I found this gig with Listen Money Matters. Thanks, Andrew and Laura. Enjoy designing sweet social media banners? Know a thing or two about fonts? Like crafting thought-provoking images? There’s plenty of opportunities to showcase your skills and make money online through work as a graphic designer. Tap into your inner-visual artist and check out sites like 99Designs, Behance or Dribble. If you’re like me and need to take 30 pictures of something because you’ve got to try every possible angle and light-setting – sell your photos to stock photography sites. Companies like Adobe Stock, Twenty20, iStock and Shutterstock offer competitive rates per image. Pro-tip: AirBnB hires photographers to take pictures of rentals. Real Estate companies pay for high-quality photos of their properties. All those lovely images you see in brochures were taken by a photographer. Why not you? OK, this may not be 100% online but could be an alternative to starting a higher maintenance, wedding photography business for example. Designing apps and other cool stuff that developers do. Explore job-finding sites tailor-made for developers like RentaCoder, WPhired, WordPress Jobs, RubyInside and CodeMentor. Due to the increase of people working remotely, the opportunity to make money online as a freelancer is growing. If administrative tasks like making reservations, scheduling appointments and paying bills are your cup of tea, be a VA! Work-from-home jobs are climbing, creating the need for VAs in high demand. And, you can earn between $30-$60 an hour doing it. Location, experience and the quality of your work determine your hourly rate. Check out Zirtual, VANetworking, ContemporaryVA, and Elance. Like crunching numbers? If you’re in possession of savvy numerical skills, there are ways for you to apply your services online. Bookminders, BIDaWIZ, Accounting Department and Assurance Financial Management provide places for accountants to connect with people in need of an experienced pro – like you! “Money never sleeps” – Gordon Gekko, Wall Street. Credit cards get a bad rap because of the number of people using them irresponsibly. Those people make poor choices, rack up obscene amounts of debt, and continue purchasing things they can’t afford. But, you are a Listen Money Matters reader. You’re ahead of the curve. So, I’ve got no qualms about telling you wielding your credit card the way Gandalf wields his staff will serve you. Chase Freedom Unlimited and Capital One Savor One both offer a $150 cash-back sign-up bonus after spending $500 within the first three months of opening your account. That’s like getting 30% of your $500 back. Overwhelmed by all the cards out there and don’t know where to start? Check out Credible. They instantly compare credit cards for you. Pro-tip: Shop through your credit card company’s online shopping portal to receive even more rewards in the form of points, cash, and gift cards. While we’re at it, take a look at opening an online checking or online savings account. Online checking accounts like Chase Total Checking and SunTrust Signature Advantage offer great sign-up bonuses. Alternatively, high-yield, online savings accounts like Ally (2%APY) put your money to work. At the end of each month, the higher interest rate yields you more cash than if you opened an account with a brick and mortar bank. Boo-yah! Even better, earn a 2.20% APY with Betterment Smart Saver. It operates as a savings account except they put your cash into a low-risk investment account composed of bonds. If rates rise, so does your yield! If you’re comfortable lending money to strangers, peer-to-peer lending will be right up your alley. P2P affords you the opportunity to lend money to individuals or businesses in need. Loan amounts vary depending on the company – usually around $1,000 minimum up to $50,000 max for a personal loan. Like with any loan, it does involve some risk. However, the companies connecting lenders to borrowers go to great lengths to mitigate loan defaults. Top players in this space include Upstart, Funding Circle and The Lending Club. It’s the easiest way to break into real estate. Your money is pooled with groups of other investors, and the properties are in the United States. The team at Fundrise identifies, acquires and manages them for you. You earn money either through quarterly dividends or appreciation of your properties. 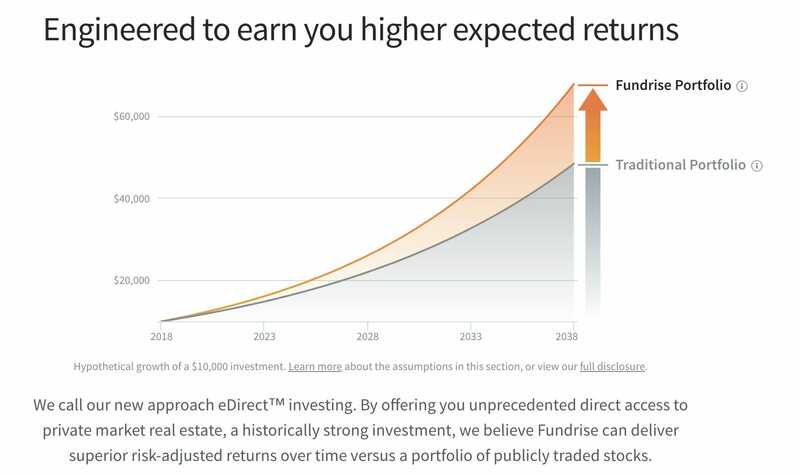 This kind of investment is typically for investors with a minimum five-year time horizon. However, Fundrise has implemented a monthly liquidity feature after a 60-day waiting period. Fundrise does charge a 1% all-in fee for their services. On the bright side, this investing gains you access to properties you wouldn’t have access to alone. Generate immediate, positive cash-flow through purchasing and selling certified, Single-Family rental properties across the U.S. Like Fundrise, Roofstock has a concierge suite of professionals who have your back 24/7. You can be as hands-off as you’d like. Fixing leaky pipes and clogged toilets in your tenant’s home aren’t your problem – a project manager with handle them for you. Of course, it’s not that easy. It takes hard work to grow a blog or authority site into a revenue-generating behemoth. Why? Because you’ve got to have the patience, professionalism, and willingness to think of it as a long-term investment. The profit potential is enormous, but it takes time. Also, leveraging a social media platform that’s relevant to your niche can help accelerate spreading your message. Have a specific topic you can’t shut up about. Create epic content around it. Provide value and grow your audience by staying consistent. You can monetize it like a blog through affiliate programs, sponsorships, ads, online products/courses and consulting. Food for thought: crowdfunding lets you receive pledges from your audience. Lots of people are bypassing the traditional literary agent and going the self-publishing route. If you’re looking to write the next great American novel, memoir, or ‘ultimate how-to’ guide, check out Kindle Direct Publishing, Lulu, and iBooks. Alternatively, sell it on your blog or authority site. If there’s a high demand for your content, you can make a lot of money. If you’ve got some decent quality gear lying around your house collecting dust – rent it out! It’s a great way to earn passive income. Why? Because two incomes are better than one! People make the mistake of relying heavily on one source of income. It leaves you vulnerable to the pitfalls you’ll encounter along your path to financial independence. Have ample space to host a networking event, fitness class or kitchen rental? Checkout Peerspace. Also, think about expensive items that people regularly use like 3D laser printers or tractors. See if there’s a need, and how you can fill it. Don’t want to deal with rental hassles and prefer getting rid of it? Sell it! There are many places online where you can offload your stuff. Have a knack for crafting delicious sodas? Know how to make exceptional beard oil? If you’re great at making stuff that other people will pay for, set up an e-commerce site and start earning extra cash. The best part? You can design the tees without being a designer (e.g., outsource to Fiverr) and sell without holding any inventory (e.g., TeeSpring handles all fulfillment). Does this word confuse you as it does me? Are you telling me I don’t have to keep the inventory of my products? Am I just a storefront? Whaaat?? Sounds too good to be true. It’s an online store run by you. Customers place orders with you. You, the online store owner, forward the customer’s order to your supplier (they’re the ones that hold all the inventory). Your supplier (aka drop shipper) packages and ships the order to your customer on your behalf. This online business model is growing in popularity, and some view it as a better alternative to opening a store on a platform like Etsy. Have a knack for explaining complicated subjects into easily-digestible material? Tutor someone! English. Math. Science. History. Your options are limitless. Demand and difficulty level determine your hourly rate. Earn $30 an hour and up! Start with online platforms like Wyzant, Skooli, and eTutorWorld. Are you “in possession of a particular set of skills, skills you have acquired over a long career” like Liam Neeson in the awesome film, Taken? Why not put it to good use and create online courses? Start with Udemy or Skillshare. If you have a blog, try selling there too. Another thing. Online courses provide you with the opportunity to earn passive income. Put your RN skills to use and make money online in your spare time. Telecommute positions are available in clinical care, medical case management, consulting and more. Reputable companies include UnitedHealth Group, Aetna and CareNet. If you’re not already convinced there are unlimited ways to make money online; then you’re reading the wrong article. Thanks to the internet, the potential to earn extra cash from your laptop or smartphone is exponential. Whether it’s online surveys, affiliate marketing, or selling your freelance writing services on Fiverr – there’s plenty of opportunity for everyone. What would your wallet look like with one more source of income? Two more? Try the online money stack challenge. Implement one of these ideas every week. At the end of three months, see how much your income has grown. Hustle up!